There must be something in the air. 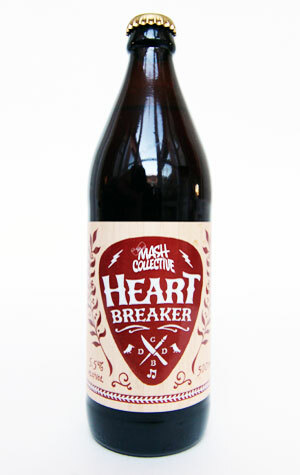 At the same time that The Crafty Pint’s younger brother was getting a sleeve tattoo based on the old pipe-smoking dude from the original Mash Collective beer, Amasia, on one side of the planet, Mash Collective number 4 was making its way into bottles and kegs here in Australia. For those new to the concept, this Stone & Wood side project sees them bring together eclectic groups of people to conceive, design and brew a beer, as well as providing its accompanying artwork. The result this time around is Heartbreaker (because it’s a limited release, so you’ll fall for it then it will leave you), a colourfully spiced and multiply hopped amber (nigh on red) ale. In the spice corner are locally sourced quandong (bush peaches that were cooked sous vide then pureed and added to the fermenter) and pepperberry. In the corner marked hops are some of the most characterful varieties known to man: Sorachi Ace, Ella, Centennial and Mosaic. Combining such big flavours may sound like a recipe for disaster but, far from it, the beer is as balanced and integrated as it is unique, with aromas that bring to mind wandering through the section of a spice store marked “Australiana” or a stroll through a tropical rainforest on a a particularly steamy day. The brewers talk of lemon myrtle but there’s eucalyptus, plum, a touch of liquorice and citrus fruits there too, with those fruity, spicy flavours melding with the sweet caramel malts just so once supped. Despite so much action on the palate, it manages to finish reasonably dry and, while such prominent and unusual flavours (for a beer) won’t be to everyone’s tastes, it’s further proof of the potential for native ingredients in brewing. Such is the way the big flavours are handled it should come as no surprise that alongside a designer (Damian Kelly) and a musician (Powderfinger’s Darren Middleton) in the Mash Collective this time around was indigenous chef Clayton Donovan, with their combined efforts creating, to our mind, the best Mash Collective beer yet.